8 years ago, on 3 and 4 May 2006, residents of San Salvador Atenco and Texcoco suffered a strong repression when Enrique Peña Nieto, the current president of Mexico, was governor of the state of Mexico. As a result of this, 47 women were sexually assaulted by police, two youth were killed, and 207 were arrested. 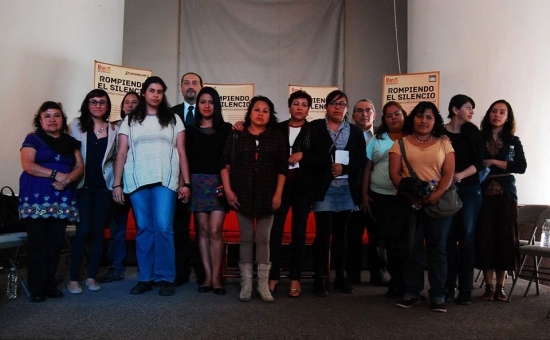 On 5 May, the Agustín Pro Juárez Center for Human Rights presented the campaign “Breaking the silence: all together against sexual violence.” The objective of the campaign is to make visible the torture–principally sexual–exercised systematically against women by security forces after these were arrested for protesting; the campaign also seeks to accompany these women and to continue denouncing the government’s strategy to see these women as “war booty.” Norma Jiménez noted that nothing has been easy since they undertook this struggle to denounce the acts which took place 8 years ago, given that they were sexually tortured, but she observed that people in solidarity have given them the strength to carry on, though now they think that it is is important to express solidarity with other women, because “it seems that all of us are in a similar situation, as though they had arrested us all–that is because this is all a conscious strategy.” For this reason, other women who have joined the campaign include Inés Fernández and Valentina Rosendo, Me’phaa indigenous women from Guerrero who in 2002 began another struggle to denounce the rights-violations and sexual torture to which they were subjected by soldiers in the Mexican Army. Beyond this, the Front for Peoples in Defense of the Land (FPDT) recently accused the municipal government of San Salvador Atenco of organizing assemblies in which representatives of federal authorities have attempted to convince ejidatarios from Atenco and Texcoco to sell their lands for the construction of a new international airport for Mexico City. Jesús Adán Espinoza noted that the federal government would face serious opposition if it attempted to carry out its urbanization plans for “Future City” and “Rescue of the Former Texcoco Lake,” as such works would only reactivate the project to build the new airport. “These projects will only bring the further degradation of our traditions, customs, and our lands if we allow them to pass,” he declared. This entry was posted on Friday, May 16th, 2014 at 1:57 pm and is filed under Atenco, Disappeared, Guerrero, Human Rights, Human Rights Defenders, Indigenous people, Justice system, Land and Territory, Land rights, Mexico, Militarization, Paramilitary, Political Prisoners/Prisoner of Conscience, torture, Women, Youth. You can follow any responses to this entry through the RSS 2.0 feed. You can leave a response, or trackback from your own site.